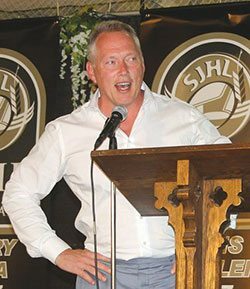 It was a day full of fun at the Iron Horse Klippers Celebrity Golf tournament and SJHL Hall of Fame induction ceremony on Saturday. It was a beautiful day for a round of golf. Sixty-three players making up 14 teams with local Klippers supporters and celebrities hit the course for an 18-hole scramble tournament. Following the tournament, players returned to the Co-op arena for a great supper catered by the Kindersley Inn, followed by the Hall of Fame inductions and speeches. Approximately 275 people were in attendance at the banquet that also included a few live and several silent auction items. The spotlight was on the Hall of Fame inductees: Terry Shea, Devin Edgerton, Chris Winkler, Derek Dorsett, Dave Hunchak, Troy Schwab, Greg Paslawski and the Klippers RBC Cup finalists team from the 2003-04 season. They were all given special rings and presented with banners that will now hang in the WCEC. President of the Junior Klippers, Brett Sautner, said the day went very well. For more on this story, please see the June 28 print edition of The Clarion.